Made by Joel is one of my favorite destinations on the Internet. I've written about Joel's brilliant handiwork and artful creations at both EcoSalon and Inhabitots, and I wanted to introduce this savvy dad's enchanting blog to you here on Petite Planet as well! Joel details the art and craft projects he makes for his kids on his blog, Made by Joel. The beauty behind his work is that it is simple yet ingenious, and he typically employs household objects and odds and ends to make fun come to life for his children. Case in point above: Joel's 'Toddler Stilts,' which he whipped up with wood and rope. They are a throwback to the old coffee can stilts of yesteryear, but they keep young kids safer and closer to the ground! I love the thought of using these stilts to help kids hone their coordination and concentration skills. Olivia has a keen interest in jumping rope, but she's a long way from mastering the art... and I think these stilts would put her on the path to understanding the concept better. 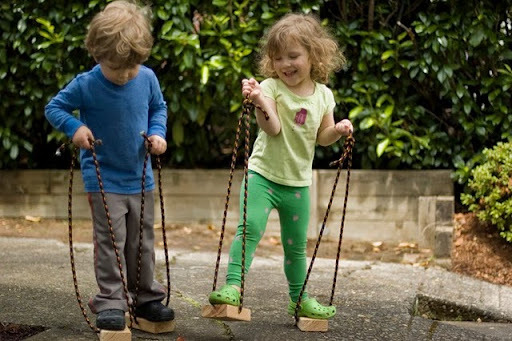 If you have more than one child, you can make a few pairs and have them do stilt races down the sidewalk too!